Just Shutters offer the finest quality, value and choice of window shutters Wantage. Stunning interior plantation shutters add a unique, timeless elegance to any home or business. 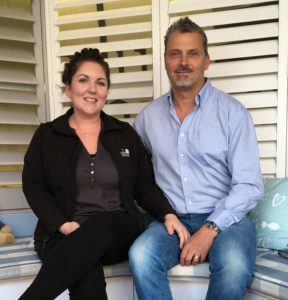 Charlotte and James Chenery are your local shutter specialists. With their expert knowledge, love of design and eye for detail, they can take any window or door and specially create a stylish feature. For the widest range of interior shutters in Wantage please call us on 01235 424282. Alternatively please follow the links below and arrange an appointment or download our brochure online. Just Shutters provide the finest range of styles, materials and finishes to ensure that your shutters are as unique as you are. We even have our own exclusive ranges you will not find anywhere else! 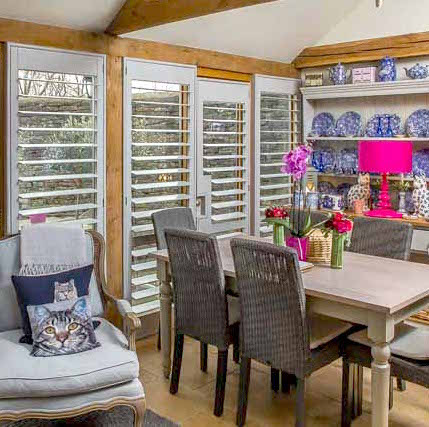 Charlotte and James always listen to you and aim to create shutters that fit your personality and lifestyle, and our extensive options mean whatever your style, our shutters will be made to complement you perfectly. We have experience in every style of home you can imagine; from castles to the most modern of flats. We appreciate how special your home is. So whether you are in the historic market town itself, or out in the surrounding countryside; whether your home is a contemporary apartment or period home King Alfred the Great himself would be proud of; your home is your castle and we will treat it that way. Whether your home and style is modern and crisp, bright and bold, or cosy and traditional we WILL create the perfect shutters for your home. We have over 8000 delighted customers and the skills to make your home even more beautiful. The difference with shutters is clear; other window solutions such as fabric blinds and curtains can go out of fashion. These, along with lesser wooden products can warp, fade and wear. While beautiful plantation shutters have been gracing homes for centuries and do not fade or warp or bleach in the sun. What is more, with the Just Shutters industry leading lifetime guarantee, their value lasts and lasts. There are so many benefits to shutters above and beyond the aesthetic. Their light and shade control is second-to-none; from fully open to fully closed, shutter louvers offer the perfect adjustable ambience. Shutters keep you private on the inside while allowing light in and you to see out; furthermore, without the need for old-fashioned net curtains! Not only are shutters the perfect addition to any living space, they are excellent in warm or humid environments such as kitchens or bathrooms. With no risk of mildewing or moulding like fabrics. Children’s bedrooms can also benefit hugely from shutters. With no dangerous pull cords they are safe for youngsters and wipe clean of any little handprints. – Long term value; shutters can add value to your home and last and last! – Curb appeal; your home not only looks striking from the inside but also the out. Just Shutters are the shutter experts in Wantage the surrounding areas. Shutters are not a sideline, nor an addition, to us they are a passion. We are the shutter specialists! We would be so delighted to show you why we are not ‘Just’ another shutters company. Call us on 01235 424282. Alternatively, follow the links below for further information. We could blow our own trumpet but believe our work should speak for us. Please see a few testimonials taken from independent website checkatrade.com. There are over 1500 published online giving us an overall score of 9.9/10. We are working on the other 0.1%. Shutters fitted to four windows. Shutters fitted to 2 bay windows. New shutters installed in bedroom and patio doors. Brilliant fast clean and efficient service.